Project summary: The interacting particle method approximates a given probability distribution by allowing particles in real space to evolve according to a system of coupled (hence "interacting") differential equations, so that the particles' empirical density approaches the target distribution. 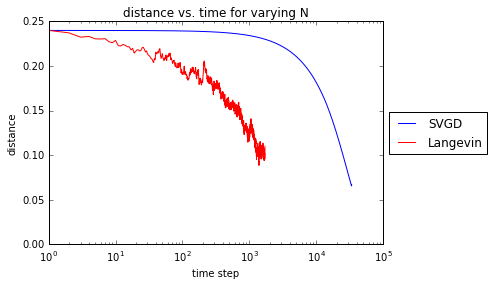 We investigate a type of interacting particle algorithm called the Stein Variational Gradient Descent (SVGD), which takes particles to highest-probability regions via gradient descent while achieving a degree of spread via convolution with a kernel. 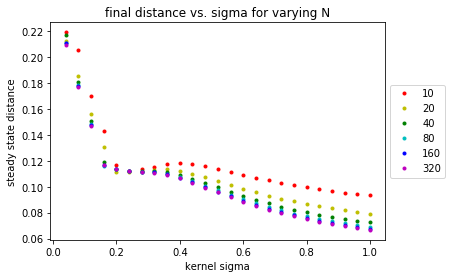 Given that we seek the shortest time to convergence and the smallest distance between the empirical density and the target distribution at steady state, we run the SVGD algorithm under varying parameters and find the optimal combination of parameters for each choice of target. 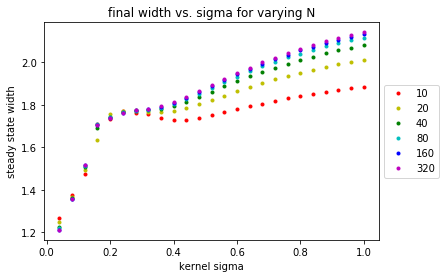 Download the report: "The Impact of Kernel Parameters on Performance of the Stein Variational Gradient Descent Algorithm"